Meant to comment on this last week. "War Horse", said Horse and Hound on their 22nd April cover. "Behind the scenes of the play taking horse world by storm." And it's an interesting article, looking at what it's like to be a puppeteer. There is though, absolutely no mention of the fact that the play is based on a book, that it has an author, and a story, and is not just frightfully clever people pretending, extraordinarily convincingly, to be horses, and that's it. I don't know what it is about jeans these days - well, actually I think I do and I blame Alexander McQueen, him and his bumster trousers. Do not see why you cannot get a pair of jeans that are slim on the leg but will actually stay up. Have spent incredibly frustrating day hauling up jeans despite belt. I lost weight since I bought them and I thought that would help as there would be more for the belt to bite on, so to speak, but it's a complete and utter waste of time. 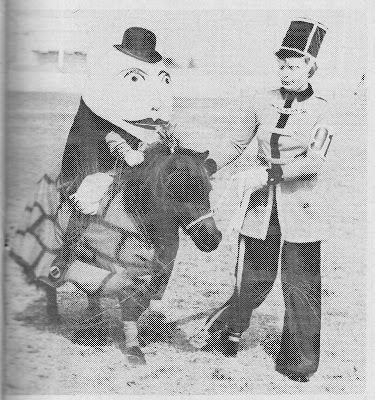 You might remember I posted about this entry in the Ponies of Britain Summer Show of 1976, and wondered "Could Humpty actually see? What would have happened if the soldier had dropped the lead rope and the Shetland wall had been left to his own devices?" Many bookdealers get Sheppards newsletter every week (they publish a directory of bookdealers), and two weeks ago the editor, Richard Sheppard, put on a poll to gauge what bookdealers were going to do with Amazon's new diktat. I can't seem to put a table into this blog (sure I could if I fiddled with the html but I think I'll give that a miss in the interests of finishing work before Glee starts), so here are the non-tabulated results to the question "Will you accept Amazon's Pricing Parity policy?" 506 votes were cast. I freely admit I've bought more than my fair share of books from Amazon in the past years, but now I've taken the vow of abstinence and avoidance as far as they're concerned, I have to look elsewhere. Get your act together, guys. I tried to buy a recently republished book - The Sweet Running Filly by Barbara van Tuyl. It will cost you £7.00 plus p&p on Amazon; delivery time 2-3 weeks. I'll go direct to the States, I thought, as it's an American book. So, I tried Barnes & Noble. Good, smooth ordering experience, shipping pricey (a bit over £8.00) but that's not surprising from the USA. Ordered yesterday - today get email cancelling, as they're out of stock. No option to re-order, no idea of when it might be back in again. Perhaps it's not as difficult as it might appear. If individual titles can be tracked, so can sellers.